Love leads to treasures when collectors and creators follow their passions. Actor Christopher Lee Gibson explains how a radio drama/graphic novel mashup will entertain at RIAF. Hot topics, talk and history. Our five picks for October. Food critic Marsha Fottler says the new Fins at Sharky's on the Pier is a great place for visitors and locals alike. Barbara Harris says community gardens provide common ground. Bits and bites from contributing food editor Judi Gallagher. Saks' G.M. Joel Ellzey on the dazzling new store--and bringing menswear back. From celebrity buyers to tony teardowns, Bob Plunket dishes on the deals, steals and scoops of the year. An Impressive architectural legacy inspires one couple's new modern, high-tech home near downtown Sarasota. A Ritz-Carlton penthouse gets an elegant uptown update. 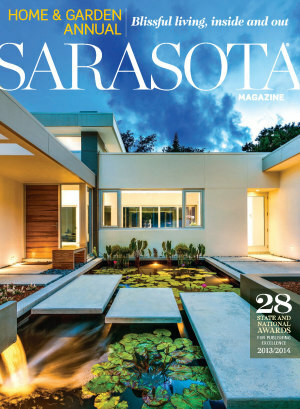 A Guy Peterson-designed modern home salutes its Sarasota roots and island setting. An architect’s own home successfully blends old and new. Blissful living inside and out. How Should Our Buildings Adapt to Florida's Rising Sea Levels? As sea levels rise and Florida sinks, how should our buildings adapt? The new Perez Art Museum Miami points the way. This election offers a cast of characters worthy of a Carl Hiaasen novel. Genius looks and loot from our style blogger. A New York couple settles into a Sarasota School gem. This year, the Florida House--the first green demonstration house in the country--will reopen its doors to the public. The Sarasota Architectural Foundation hosts its inaugural Sarasota MOD Weekend Oct. 9-12. Pam Daniel on how rising waters will reshape our city.